I try to calculate the symmetric difference for a set of segment groups A and B with precision of 1E-5 (ST_SnapedToGrid(geom,1E-5). I've formulated the an ideal test case for a H based shape segment group A and the segment group B containing only the vertical bars of the H. If I build the symmetric difference, I get the expected result, the horizontal bar of the H.
If I use a similar setup like in this real world example, I get an unexpected result. -- Segment group A the "H"
-- Segment group B The only the vertical bars of the "H"
Result is the complete segment group A.
as marked with the black circles. What I'm doing wrong or is it a matter of mathmatical precision? 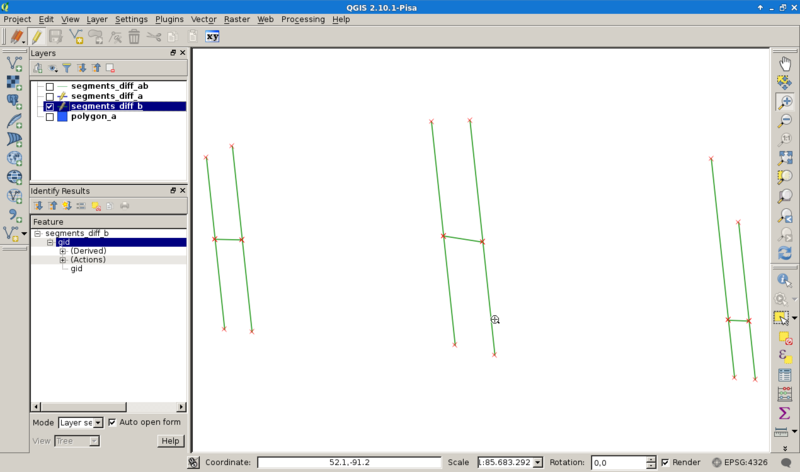 The setup of the segment groups is related to this GIS-SE post. The issue is that the two geometries don't share common nodes. For instance, A has vertices mid-way that don't exist in B. 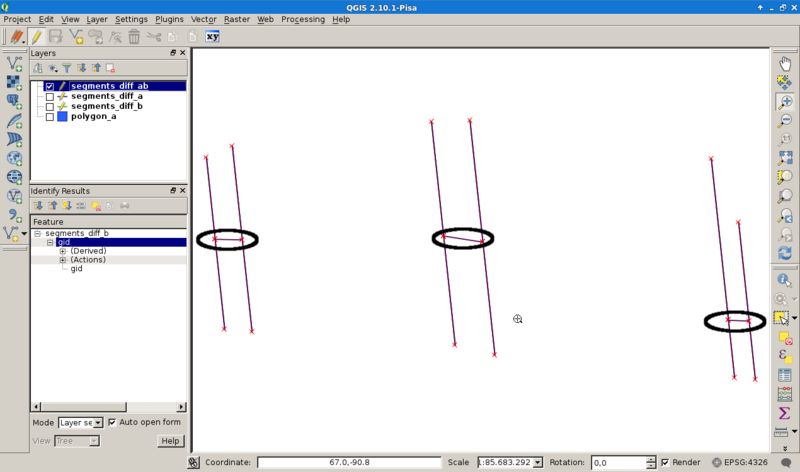 While they visually overlap, there are tiny round-off errors from the interpolation used in the algorithm to determine differences, and you see unexpected results. Not the answer you're looking for? Browse other questions tagged postgis postgresql overlay symmetricdifference or ask your own question.